Welcome to the monthly e-bulletin of the South Asia Media Solidarity Network (SAMSN). The next bulletin will be sent on January 16, 2017, and your inputs are most welcome. Journalist unions from across the Asia-Pacific resolved to share knowledge, utilize new technologies, and strengthen membership to effectively continue their struggle for press freedom and journalists’ rights, at the IFJ Strategy Forum in Kathmandu, Nepal on November 23 and 24. Journalists and union activists from 14 countries participated in the meeting organized by the IFJ together with the South Asia Media Solidarity Network (SAMSN) and South East Asia Journalist Unions (SEAJU) with representatives from Afghanistan, Bhutan, Bangladesh, Cambodia, India, Indonesia, Myanmar, Malaysia, Mongolia, Nepal, Pakistan, Sri Lanka, the Philippines and Vanuatu. The meeting adopted four resolutions – two on India, one on the Philippines and one on gender equity. Read more. The IFJ and Friedrich Ebert Stiftung (FES), together with the SAMSN and SEAJU, held a significant gathering of women journalists and activists in the Asia Pacific’s media in Kathmandu, Nepal, on November 20 and 21, 2016. Participants spent two intense days evolving strategies to bring about meaningful change in order to enhance women’s experience of working in the media and also the unions that represent them. At the meeting, IFJ affiliates agreed that unions must lead and make gender equity a priority in future union strategies and endorsed significant work being done by women and men to bring about significant change, including setting measurable targets and calling on unions to demonstrate genuine commitment to gender equity through real policy change. Read more. Women media unionists from the Asia Pacific region claimed their rightful place in the media and unions. For this, media unions must effectively address issues of gender equity and adopt best practices in order to strengthen the numbers and voices of women in unions, especially in decision-making positions. Active mentoring; capacity building; leadership training; family-friendly union practices; implementation of policies against sexual harassment; and active engagement of men can remove barriers to women’s growth in professional as well as union settings. Read the complete resolution here. Journalists of the Asia Pacific, representing journalists’ trade unions and associations, called urgently for peace in Kashmir, India. They strongly condemn the attacks and restrictions on media reporting of the Kashmir conflict, in particular the arbitrary ban on the Kashmir Reader daily newspaper. They also condemned the restrictions on the use of internet and mobile phones in the conflict-affected Kashmir Valley, which affects newsgathering and dissemination. It also impedes news reporting from the ground, thus affecting the public’s right to know and freedom of expression of the people of Kashmir. Journalists in Kashmir are at constant risk while covering clashes and military operations. We demand adequate measures to provide safety and risk insurance for them. Read the resolution here. In light of the increasingly brutal attacks on journalists in India, journalists of the Asia Pacific, representing journalists’ trade unions and associations, called for the government to immediately bring to justice those who attack journalists. These measures include the immediate enactment of a Journalists’ Protection Act at the national level and other mechanisms to address the suffering of families of slain and attacked journalists. The impunity of perpetrators, which has a devastating effect on press freedom in India must end forthwith. Read the resolution here. A Bangladesh court on November 30 convicted and sentenced nine persons to life in prison for the 2004 murder of journalist Manik Saha. The court also fined convicts Akram Hosain Hawladar, Ali Akbar Shikdar alias Shaon, Nuruzzaman, Mithun, Suman, Sattar alias Disco Sattar, Bellal alias Bulbul, Saka alias Sakawat Hossain, and Sarwar Hossain alias Saro, Tk 10,000 each. Among the convicts, four are at large whereas five were sent to jail. Among 14 accused, two were acquitted and three – Abur Rashid, Altaf and Mahfuz – were killed in crossfire incidents. Saha, a journalist with New Age daily and BBC, was killed on January 15, 2004 while returning home from covering a meeting of the opposition Awami League. Read more. Commander Vice Admiral Ravi Wijayagunaratne of the Sri Lankan Navy attacked a journalist at the Magampura Port in Hambantota, Southern Province on December 10. The Commander assaulted Roshan Gunasekera, a local correspondent for The Island and Divaina dailies, while the journalist was reporting navy action to open the port blocked by protesting port workers. Video footage recorded by other journalists showed the commander darting towards Gunasekera, assaulting him and using foul language. Read more. Mithilesh Yadav, a Nepali journalist with Nagarik daily, was harassed at the Lila Mohan Hospital and Maternity Home Private Limited in Lahan of Siraha, eastern Nepal as he was reporting a dispute between hospital management and a patient’s relatives. Dhananjaya Yadav, a hospital employee, snatched his mobile and broke it while he was talking to hospital management about the dispute. Read more. Arjun Thapaliya, the editor of Anukalpa daily published from Golbazaar of Siraha district, eastern Nepal, was arrested on the evening of November 22 by police for his comments on a Facebook post sharing a published news story under the controversial Election Transaction Act. He was transferred to Kathmandu and was kept in detention after presenting him at the Kathmandu District Court. Read more. The Secretary of the Sri Lankan Ministry of Parliamentary Reforms and Mass Media accused the Ada Derana TV news channel of falsification of a speech by President Maithripala Sirisena in a news bulletin and demanded an explanation before further action on November 18. Earlier, on October 25, the official had written to the channel informing them that an inquiry was being conducted into this matter. The government also cancelled of license of CSN (Carlton Sports Network) TV and issues a directives to media organizations requesting not to use the term ‘collective opposition’. Read more. The Pakistan Electronic Media Regulatory Authority (PEMRA), on November 26, suspended licenses of Din News for a month and Neo TV for a week and fined them Rs 1 million (approximately USD 9,500) each for ‘levelling baseless allegations against the judge of the Supreme Court’. PEMRA also fined Sach TV Rs 1 million for the airing remarks of a caller. Three satellite TV channels were issued notices on November 19, 2016 for airing ‘irresponsible’ analysis and asked to submit their replies on November 26, 2016 after appearance in PEMRA. On November 26, the reply was submitted and the channels were allowed to present their defence. Read more. How is a ‘foreign correspondent’ defined? And who is a ‘fixer’? Does a foreign correspondent only hail from North America, Europe and Australia? Such ‘foreign correspondents’ visit the global South, or West Asia, hire people like myself as ‘fixers’, and often go on to bag the byline, the big pay and possibly even awards. Priyanka Borpujari analyses the power imbalance inherent in terms like ‘fixer’ and ‘foreign correspondent’. Read more. The trial of three Raajje TV journalists, charged with obstructing police officers while covering an opposition protest and a bomb scare, is set to close soon. If found guilty, the young reporters face up to a year in jail. Their prosecution stands in stark contrast to the lack of justice for crimes committed against the press, including the disappearance of Maldives Independent journalist Ahmed Rilwan, the arson attack on Raajje TV, the near-fatal beating of the station’s former news head, Asward Ibrahim Waheed, and the mass death threats sent via text messages to journalists. Read more. In order to draw the attention of the Government of India on growing attacks on media persons all over India during the last one decade and pressing upon its demand for enactment of a Journalists Protection Act, the National Union of Journalists (India) on December 8 submitted a memorandum to the Prime Minister Narendra Modi at the Prime Minister Office. Apart from demanding the enactment of the Act, the NUJ (India) also demanded time bound resolution of various problems faced by the journalists of both the print and electronic media and problems of small and medium newspapers. Read more. More journalists are jailed around the world than at any time since the Committee to Protect Journalists began keeping detailed records in 1990, with Turkey accounting for nearly a third of the global total. Amid an ongoing crackdown that accelerated after a failed coup attempt in July, Turkey has jailed at least 81 journalists in relation to their work, The global total of 259 journalists jailed on December 1, 2016, has gone up since 2015, a year that saw 199 behind bars worldwide. The previous global record was 232 journalists in jail in 2012. 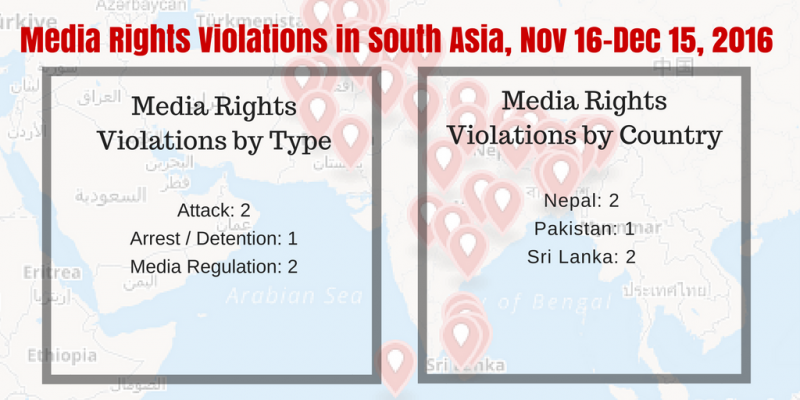 In South Asia, 3 journalists are in jail: 2 in Bangladesh and one in India. Read more. In an important test case for press freedom in Bhutan, a journalist is facing a defamation suit for sharing a Facebook post. The journalist, Namgay Zam, has been accused of libel by the businessman, Sonam Phuntsho. The post includes allegations that Phuntsho had garnered favours from the country’s judiciary, where his son-in-law is chief justice. Zam, a former television presenter with the state-run Bhutan Broadcasting Service, face a maximum fine of about $38,000 or up to three years in prison if convicted. Read more. Human rights and encryption, the eighth title in the UNESCO Series on Internet Freedom, was launched at the 11th Internet Governance Forum in Guadalajara, Mexico, on December 2016. This study addresses the relevance of encryption to human rights in the media and communications field and offers policy recommendations for state practice and other stakeholders. Find the report here. Senior journalist Gauri Lankesh based in Bangalore, India, was convicted in a defamation case filed by MP Pralhad Joshi in India. Pronouncing the judgement, the court sentenced her to six months imprisonment besides imposing a Rs 10,000 fine. She avoided the arrest by getting anticipatory bail from the same court. Joshi had filed a defamation case objecting to a report against BJP leaders published by Lankesh in her periodical on January 23, 2008. More here. “My killers are still free” is the UNESCO campaign to raise awareness of the high level of journalists’ killings and the prevailing impunity for crimes committed against them, as well as to present key findings of the biennial Report of the UNESCO Director-General on the Safety of Journalists and the Danger of Impunity. The website contains among other things an interactive maps and audio testimonies including those from Sonali Samarasinghe, widow of Lasantha Wickrematunge, Sri Lankan Editor-in-Chief, and Rafida Ahmed, widow of Avijit Roy, Bangladeshi-US blogger. More here. Mindless abuse and threats of violence are commonplace on online speech platforms like social media websites nowadays, says a new report, ‘Online Harassment: A Form of Censorship’, by SFLC.in, a Delhi-based not-for-profit legal services organization. Greater transparency and responsiveness in content moderation processes adopted by such platforms, along with renewed focus on capacity building for law enforcement agents could go a long way towards addressing the issue, finds the report. Attention should also be paid to educating people about existing mechanisms for combating online harassment, the report adds. Find the report here.